In today’s busybody world, almost all of us use a notes app to jot down things we need to get done, or reference at a later point in time. The Notes app market is already overcrowded with apps such as Evernote, Astrid, Wunderlist et all, but Google believes there’s room for more. So it’s out with Google Keep, an Android notes app that will obviously integrate with the popular Google Drive, and hopefully some day, with its chat services as well. Let’s take a look at how Google Keep works and see if its worth downloading. 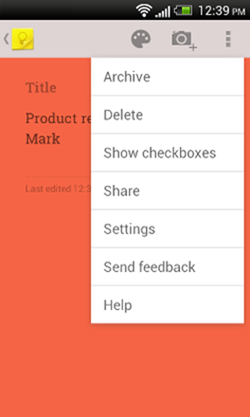 Google Keep works only on devices running Android 4.0 and up but you can access it also through your Google Drive account, which somewhat limits its usefulness. 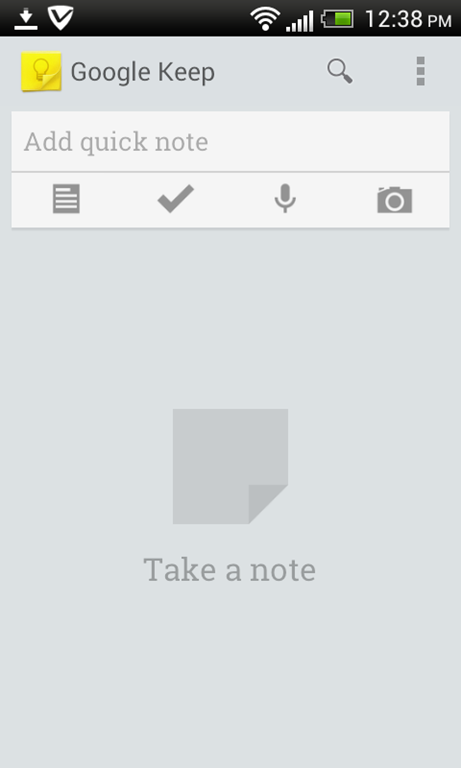 Any notes you take will obviously get automatically synced to Google Drive. To get started with the app, you first need to first connect it to a Google account. Then just start adding your notes. To add a note, you just need to hit the screen and start typing. You can create simple texts, list items, image captures, and even speak a message. 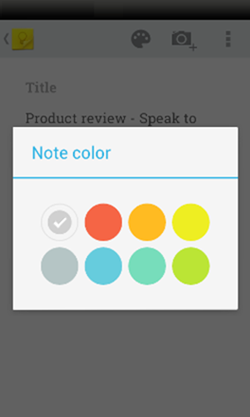 A cool feature with the app is the ability to color code a note. You can choose from about 7 pretty colors. Notes are also attractively displayed on the screen, so if you plan to note down something of a sensitive nature, you’d better beware. The menu options let you archive notes, display or hide checkboxes, delete notes, share them, or change the order of viewing from single to multi-column views. You can also directly delete, archive, or share a note you are looking at. Archiving can also be done by swiping across the screen. Rearranging notes is also pretty simple. Long press a note to move it up or down to a desired location. The Camera app lets you instantly add a captured image to a note though you cannot add images previously taken. Finally, the Voice note still has a long way to go. My message to meet John ended up as pk song! The app also installs a couple of widgets, one will let you scroll through your notes right from the home screen; and the second widget is a shortcut bar that will let you quickly add a note from the home screen. Both really cool and useful widgets. 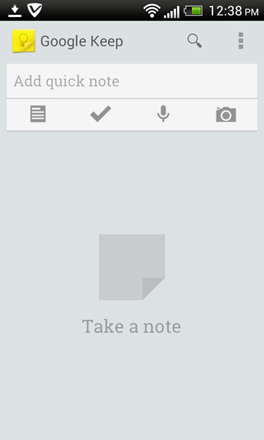 All your notes can be found in drive.google.com/keep. I couldn’t find a way to directly go to the Notes page from my Drive account though. And, while I did find all my notes, the color coding was missing. Overall, Google Keep is a pretty simple and straightforward app for users who simply want an app to take notes and not do much else. Users looking for more advanced features will have to wait to see if they do pop up with future updates, which I’m pretty sure will eventually happen. The lack of a reminder for the actionable notes is a sore point. No point in taking notes if you don’t do it on time. I expect Google Keep to bring a lot of folks into the fold, irrespective of the fact that Google products tend to have a poor shelf life. 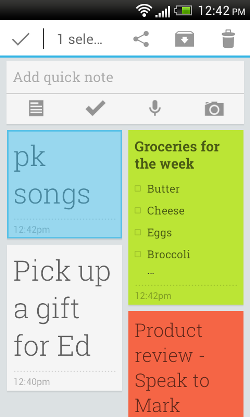 If you are willing to live with that, and a few other shortcomings, Google Keep is for you.